The Stay big top returns to downtown State College and Pop Up Ave on April 27. No seashells, but we'll have a full complement of U.S.-made Stay tees and accessories at all of our appearances as winter gives way to spring. May 11: Hershey West End ArtFest, 9 a.m. to 4 p.m. at Cocoa Beanery, 1215 Research Blvd. May 18: Downtown Hershey Art Show & Culturefest, 10 a.m. to 5 p.m.
Of course, if you can't see us in person, we sell everything online and offer fast, affordable shipping ($5 per order, free for purchases of $75 or more in the contiguous United States). In person or online, you always get a free Stay sticker with any purchase. 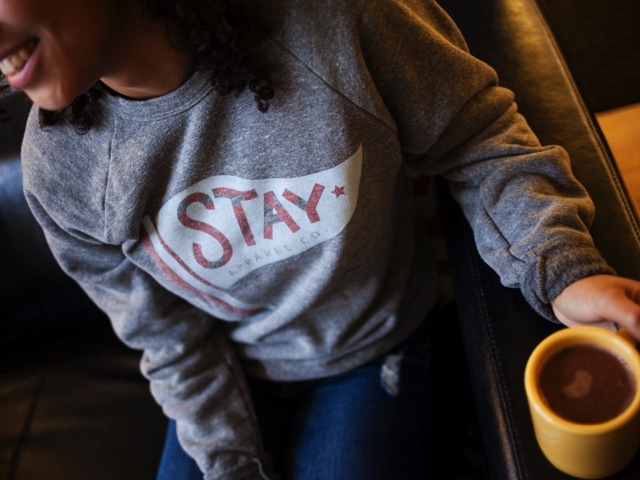 Thank you for being a part of Stay Apparel Co.'s first full year! 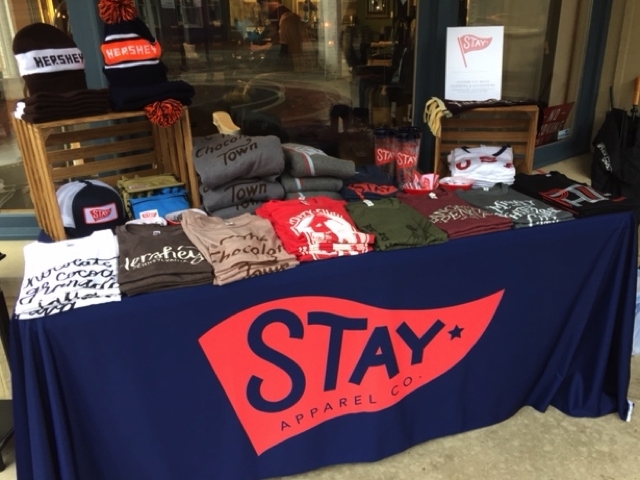 Having launched Stay Apparel Co. in October 2017, we had only four public appearances under our belt when 2018 began. Besides continuing to push online sales, we had a modest goal of averaging at least two appearances per month. But thanks to opportunities that we hadn’t anticipated, we got ahead of our projected pace in April and really took off in June. On the strength of a 13-week run at Market on Chocolate in Hershey, we achieved our goal by August. And with a flurry of activity in December, including three dates when we were in two places at the same time, we participated in 47 events across 48 dates during the year. We regularly attended the Harrisburg Flea, York Flea and Creatively Lancaster and even helped to start a makers market at the Cocoa Beanery in Hershey. On a brilliant first day of fall, we debuted at Pop Up Avenue in State College. The stops were many and varied. We set up shop in Strawberry Square in Harrisburg and Central Market in York. We pitched our blue big top in the middle of Cocoa Avenue during Artfest in Hershey and in the westbound lane of the Columbia-Wrightsville Bridge for the Bridge Bust that overlooked the Susquehanna River. We sold tees on the concourse at Clipper Magazine Stadium in Lancaster and at ice level of Hersheypark Arena. We brought our wheeled mannequin, purchased at a closing Bon-Ton in Camp Hill, to three Creatively Lancaster shows held on consecutive Saturdays within a closed Bon-Ton at Park City Center. We had a few clunker shows in terms of sales, but then again, too few to mention. After all, every show, no matter how much or how little business we did, presented an opportunity to get Stay in front of people. We take a long-term view of customer relations. We know that just because someone doesn’t buy from us today doesn’t mean they won’t on another day. I was vividly reminded of this at the York Flea on Dec. 1 when a man (with his wife and daughter) who had braved the rain that ultimately cut short that event told me that he had seen Stay at the Bridge Bust on Oct. 6. He had regretted not buying from us then, he said, and came to the York Flea specifically to see us. He purchased two tees and earned my eternal gratitude. Our big takeaway from 2018 is that people are intrigued by the Stay name — “So what does Stay mean?” someone invariably asks — our products and our vibe. We feel like we’re on to something, whether it’s because we only sell U.S.-made products, or because of our cool designs, or because we deliver great customer service. It’s difficult to pinpoint, but we’re unwavering in our commitment to all three. Thank you to everyone who contributed to a fun, busy and successful first full year. We are eager to do even more in 2019. We resolve to work even harder to earn repeat business and to welcome new faces, literally and figuratively, into the Stay tent. Years ago, I coordinated a visit to Harrisburg by former Philadelphia Phillies star Tug McGraw. Even though he spilled a beer on my pant leg and didn’t apologize, I enjoyed the guy. In a TV interview, someone asked why he was at what was then RiverSide Stadium. “If there’s a baseball game, the Tugger wants to be there,” the Tugger said. Likewise, if someone invites Stay to set up a table or tent, we’ll make every effort to be there. We have a pretty good idea where we want to be in 2019, but we’re entirely open to additional opportunities. If you have suggestions, please send them to hello@stayapparel.com. In the meantime, we’re looking forward to our first appearance in the new year: Jan. 5 at the Harrisburg Flea, when we’ll debut a new design on our first women’s cut and children’s tees. After a 13-week stint with Market on Chocolate in Hershey this summer, we're looking forward to hitting the road this fall. Sept. 1: Harrisburg Flea from 9 a.m. to 3 p.m. at Midtown Cinema, 250 Reily St.
Sept. 2: York Flea at What the Food Trucks, an admission-free block party from 11 a.m. to 6 p.m. featuring 40 trucks and carts, live music, beer and merchants. Sept. 8: Creatively Lancaster from 10 a.m. to 3 p.m. at Clipper Magazine Stadium, home of the Lancaster Barnstormers. Sept. 22: Pop-Up Avenue in downtown State College, on South Fraser Street between College and Beaver avenues. It runs from 11 a.m. to 7 p.m. and includes live music, food vendors and a beer garden. Sept. 29: The Hershey-Derry Township Historical Society's first "Brews, Brats & Bands" from 4 to 7 p.m. at Cocoa Beanery, 1215 Research Blvd., Hummelstown. Oct. 6: Bridge Bust from 8 a.m. to 4 p.m. on Veterans Memorial Bridge between Columbia and Wrightsville. We'll be among nearly 300 vendors on the 1.25-mile bridge, which will be closed to auto traffic. Oct. 13: Let's play two! We're back at Clipper Magazine Stadium for another Creatively Lancaster pop-up event from 10 a.m. to 3 p.m.
You'll also find a limited selection of Stay items at these fine local retailers: Hershey Pharmacy & Gifts, Hershey-Derry Township Historical Society, and Knock Knock Boutique, Hershey; Arthur & Daughters and York Revolution team store, York; and Spotted Owl Boutique, Lititz. Market on Chocolate is from 10 a.m. to 2 p.m. Saturdays in ChocolateTown Square. Hershey is our home for the summer. Starting June 2, you'll find the Stay tent in downtown Hershey from 10 a.m. to 2 p.m. every Saturday through August as part of Market on Chocolate. 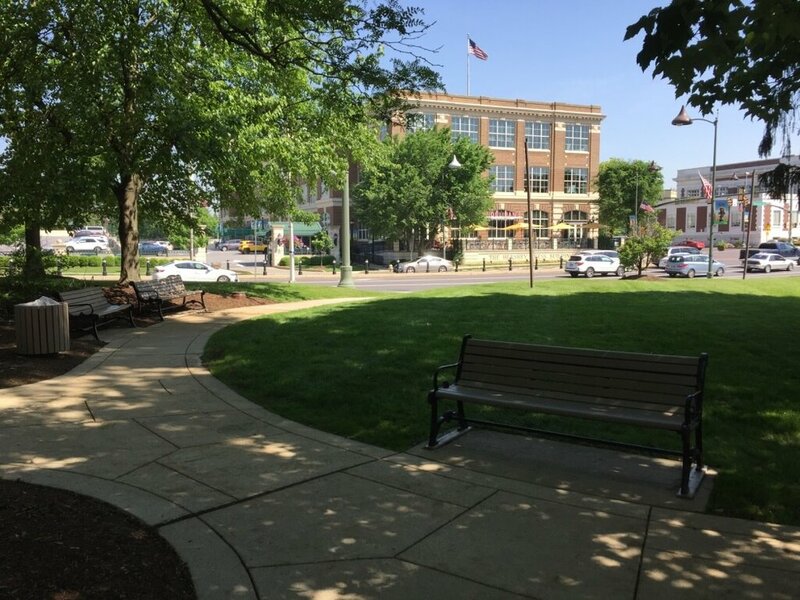 Sponsored by the nonprofit Downtown Hershey Association, Market on Chocolate this year will feature some 20 vendors every week in ChocolateTown Square. "This year the market will feature many new and returning vendors selling a multitude of goods ranging from craft prepared foods, to unique jewelry and artisan wares, to locally grown items. The market also includes entertainment, children’s activities, and community programming in addition to fitness classes and other special events." We'll have all of our Hershey tees and many others with us, but if there's a particular item or size that you'd like to see on a given Saturday, please drop us a note in advance at hello@stayapparel.com. We'll do our best to accommodate all requests. We look forward to meeting you at Market on Chocolate and to a great summer in downtown Hershey. We hope you've enjoyed your Stay in 2017. We'll see you in the new year! We'll forever treasure 2017 as the year we launched Stay Apparel Co. If you were among the many people who supported our efforts in some way, we offer a heartfelt thank you. If you weren't among them, then we look forward to welcoming you into the fold in 2018. Feb. 3: Central Market in York, 9 a.m. to 2 p.m. Wherever we are, please stop by, say hello, and pick up a free Stay sticker. Meanwhile, if you know of an event that seems like a good fit for Stay, please let us know at hello@stayapparel.com. We welcome your suggestions. We wish you the very best in the year ahead. Wherever you go, enjoy your Stay! Stay is in motion for the holidays, bringing our pop-up shopping experience to York and Hershey. 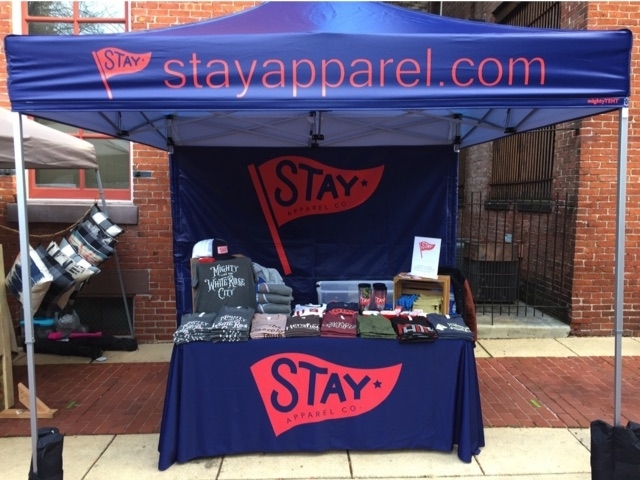 On Dec. 2, we're debuting our Stay-branded tent at York Flea's inaugural Holiday Flea from noon to 8 p.m. in Cherry Lane Park. We'll have a full complement of merch, including our "Mighty Like the White Rose City" tee. On Dec. 16, we're returning to Steele Hair Salon, 15 Briarcrest Square, time to be determined. We had a great response to our first "Stay at Steele" event on Nov. 18, despite the rain. We look forward to see you in December. Please stop by, say hi, and grab a free Stay sticker.